Each summer brings a different vibe of sorts to Family House. Many of our regular volunteers change their schedules, and with school-aged kids out for the summer, many of those students choose to devote some of their time off to volunteering at Family House. 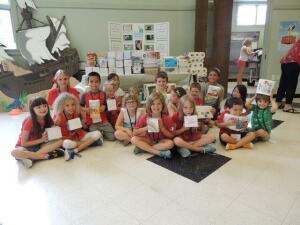 The children pictured to the right are from Vacation Church School from Christ United Methodist Church, who collected much needed items from our Wish List. Several kids of some of our regular meal providers, have assisted with meals for our guests, including the monthly breakfast provided by the Oak Men’s Group and the dinner that was recently provided by the Raquettes. 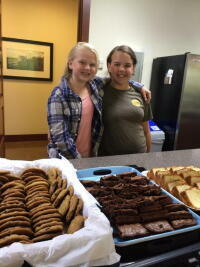 In addition to these young volunteers, generous bakers like Bella Moshier and Adele Harris, pictured to the left, have dropped off homemade treats for our guests – sweets that never seem to last very long once they’re placed in our kitchen. The true spirit of SECU Family House is one of selfless giving and regular acts of kindness. Our many volunteers, including our young summer volunteers, serve to strengthen our mission of providing an affordable, safe, nurturing home for seriously ill patients, their family members, and caregivers from throughout North Carolina and beyond.